Hmmm… this is interesting. I’m thinking of the people who are uncomfortable with fuzzy goals to consider what they might need to be useful. I think it’s mostly the tangible part, which you address with the ‘sensory’ aspect. Maybe a tangent but… when I see fuzzier goals (and I specially see them when branding and user experience focus is top of mind), they are often dismissed as lower level or a subset of the “real” clear/specific/quantifiable goal. They get categorized as design principles or guidelines to inform work, which I’m only pointing out because I don’t know what that means. Perhaps that’s our sneaky way of keeping those fuzzy goals around without fighting the battle for their legitimacy. One questions I have for you is, if fuzzy goals are progressive as you say, that is something they share with the other kind of goals, which by default makes them quantifiable/qualifiable, no? Maybe first we need to define what we mean by quantifiable. For me that means something that can be counted. In factory work that makes sense — we might set a goal of 1,000 units a day, and specify some level of quality, say, 1 defect per thousand. In creative work this model falls down. Let’s say I am a publisher and I’m asking you to write a novel. What I really care about is the number of people who buy the novel once it’s complete, but that’s not a goal, it’s a success metric which can only be measured after the fact, something I would call a lagging indicator. A more specific and easily measurable goal, such as the number of words in the novel, or the number of chapters, would be even more ridiculous as a measure of success. For a goal to be useful in performing the work it must help to guide the work. It must be a leading indicator. The real goal is to write something that’s compelling, interesting to readers, etc. — a great story. Since part of what makes a novel great is its “novelty” we have a goal that can’t be defined specifically in advance. In other words there is no way to know how close or far I am from the goal without finding a way to test it, for example with a prototype. This is where the progressive part comes in. If you talk to novelists about how they work, you will find a wide variety of approaches, but most of the approaches involve the writing of multiple drafts. As the work evolves over time, the author will ask various trusted people to read and comment on the work. The function of an editor, for example, is to represent the desires and concerns of the reader. Not sure if I am answering your question or not. Could you give me some examples of the different kinds of goals you encounter in your work? I have found my life is a balance of the fuzzy and the concise. I have learned to embrace both. I need to see and touch some goals while embracing others that are almost too big to define. Hard to explain to others. Love the drawings. Dave, this is a lovely post. I’d love you to give a specific example of “knowledge work” because the rest of my comment is based on what I THINK you mean by that and if I’m wrong then I’m just broadcasting blahblahblah. “ESP” is an interesting and useful hook for your argument, but I think it’s worth exploring the three distinct relationships those adjectives have to fuzzy goals. Progressive: I think there’s more here than what you’ve presented. I’m going to suggest that goals aren’t fuzzy like a caterpillar; they are fuzzy like a far-off planet. Fuzzy goals change over time, but more specifically, they get less fuzzy as you get closer to them. As the team understands more and works towards solutions, the best fuzzy goals become something else, something clear and tangible. It may sound inefficient not to start with the tangible version, but I think what you’ve written about here is situations where the ONLY way to get to tangible success is to start with something that is just as fuzzy as it needs to be. As usual, you got my gears turning. Thanks for the post. Thanks for the comments! I’ll try to ellucidate a bit. In this context I am using knowledge work in exactly the sense you describe, where you’re embarking to some degree into the unknown. I guess you could substitute “creative work.” Examples might be the writing of a novel, or the design of a new piece of software, or the pursuit of something like artificial intelligence. I like your analogy of the trip toward a far-away planet and agree. When you begin, you don’t know everything, and most importantly, you don’t know what you don’t know. In fact you may find that on your way to the far-away planet you may find something even more valuable that your initial target. An example from real life would be the Xerox Palo Alto research center, who set out to develop a document management system and ended up inventing the personal computer. Which brings up another challenge of creative work: When you achieve your goal, or even something better than you anticipated, will you be able to recognize it? The role of fear is an interesting one. The Manhattan project and the space race are good examples of creative projects that were partially driven by fear — primarily the fear of others getting there first. Much of scientific discovery is driven by similar fears. But do the fears contribute significantly to the creative result? Fear can create a sense of urgency, it’s true. And fear can get you funding, when it’s shared by the powers that be. But there’s a pretty big chunk of brain research that says that fear tends to stifle creativity because it triggers the “flight-or-fight” response. My gut says there’s a level of fear that’s appropriate and helpful — something we could call “fun fear” — such as the fear you might have when playing a game; the fear of missing a deadline for example, or the fear of letting your team-mates down. Managing the emotion and setting deadlines are an art form that’s familiar to those who manage creative people. The deadlines need to be loose enough away to be realistic, frequent enough to keep the work on track, and tight enough to create a sense of urgency. Great post, and so apt as a “meta”-phor for the book project. Even though it’s documented you are “driving your publisher crazy,” it’s a good kind of crazy for precisely the reasons you allude too. I find the hardest part is knowing how to move a fuzzy object forward. How do you pick up and move something that is hard to get a precise grasp on? Can I double-dip on this one? I hear you on our Bald Ape Brains getting stifled by fear, but there’s also organizational fear going on here. I WANT the same thing to be true, that research would show that organizational fear stifles creativity, but my individual fear is that organizational fear makes the world go around. Even when the organization is a creative team. I still believe that the best leaders do what they can to protect their teams from this flavor of fear, but it frequently still creates momentum. I think your overall question is one that falls in the Complex Domain of knowledge as described in the Cynefin Framework. Perhaps achieving a fuzzy goal is as much about developing mutual understanding of the goal itself as it is in the achievement of the goal. Take a quick look at the visualization offered in the video included in that post to get a nice overview of the Cynefin Framework if aren’t already familiar with it. In my view, your points about the relevance of emotion, sensory, and progressive provide an interesting take on how to work, to do sense-making, within the Complex Domain of knowledge where patterns and non-linear relationships dominate thinking rather than explicit cause-effect relationships. Fuzzy goals certainly would fall into the complex and chaotic domains of this framework. I do think the purpose of fuzzy goals is to provide something to aim for when the conditions, as well as the goal, are not fully clear. In a complex world it’s rare that you can wait until you have all the details before acting. In military strategy they call it “the fog of war” — the uncertainties and unknowns that you are unaware of but will most definitely affect the outcome. And yes, developing a shared understanding of the goal is part of achieving it. Not only that, but it often needs to happen while the group is already in motion. The nature of fuzzy goals is that they may require almost continual adjustment, based on a continually improving understanding of the situation. Is progression towards fuzzy goals progressive, or iterative? Progressive, to me, sounds almost linear, but the creative process – as you mention – is often working towards unexpected results. To use Dan’s thought of a far-away planet, it’s not just that it gets clearer as you get closer; it could also be that “it” is not a planet at all when you finally get there…but it is clear! 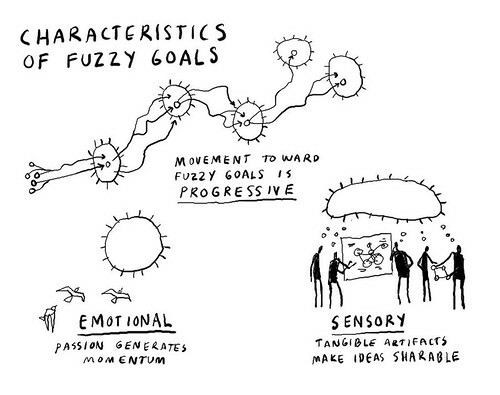 I am sure that movement toward fuzzy goals is both iterative and progressive. Iterative, in the sense that cycles of inquiry, exploration and modeling will often be repeated over and over, edging closer and closer over time toward an imagined “finished state” which may never be completely reached (think software, where each new version improves upon the last). Progressive, in the sense of a series with a definite pattern of advance; progression toward a goal. I see the creative journey as very similar to a voyage of discovery or mountain-climbing expedition. Certainly you begin with a goal, but it’s necessarily a fuzzy goal because you can’t guess in advance what you’re going to encounter on the way. These kinds of journeys need to make frequent stops to assess the changing situation and adjust the goals based on what has been learned. I imagine a series of “base camps” where the goal is reassessed and the next stage sketched out. Yes there’s definitely a component at the game level and a larger one which I have been calling the metagame: the metagame might be putting a man on the moon, which would require a lot of games, iteration and progress to get to. The MGTaylor model is interesting but feels unnecessarily complex to me. Maybe it deserves further study.